Sunny Deol and Ameesha Patel , after a long time at least ten year , a hit jodi of movie "Gadar - Ek Prem Katha" , returns back in "Bhaiyaji Superhit". In this Movie he will play Double role for first time in his film career. Sunny Deol become a varanasi boy in this movie . Sunny Deol is back after a long break of "Yamla Pagala Deewana" . 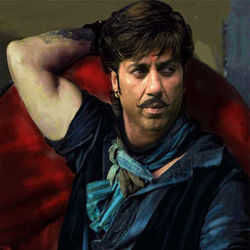 Here is the look of Sunny for "Bhaiyaji Superhit"
Ameesha tweeted, "And yes I am doing bhaiyaji superhit with sunny deol. Thank u for all the wishes n congrats." This movie has also good co-star like Arshad Warsi, Tusshar Kapoor and Prakash Raj(Ghani Bhai). Niraj Pathak will direct this movie.